For families and groups under 10 may register on site. Groups of over 10 children must to pre-register. In the summer of 2018, the eighth year of the program, nearly 4,500 children and their families enjoyed R3 and more than 4,500 free books were distributed to children from across southeastern Michigan. 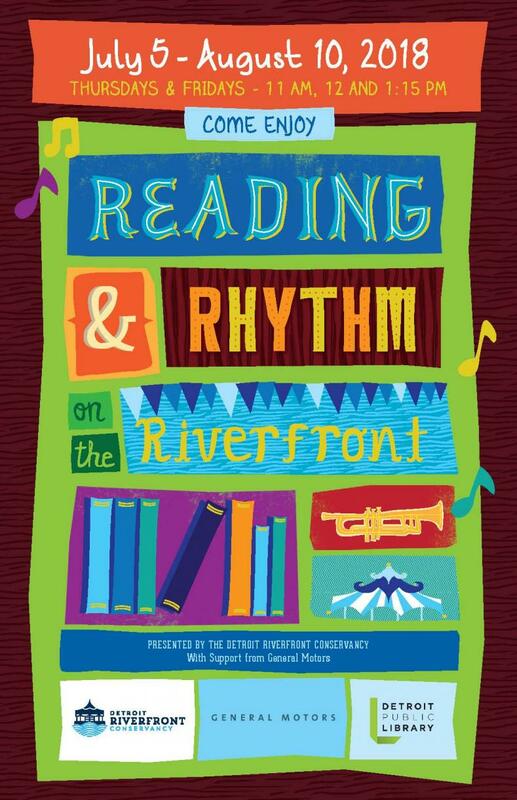 In addition to the books distributed, the program also featured a special family lending library with more than 200 selections that children and their families could check out and read along the riverfront during their visit. The Conservancy thanks General Motors for the financial support for this program and for helping share the joy of reading with children and families in the community. The 2019 program will run July 11 - August 16, with sessions taking place on Thursdays and Fridays at 11:00 AM, 12:00 PM and 1:15 PM. Each session lasts for 45 minutes. Participants must participate in the session to receive a free book and carousel ride. Families and groups under 10 do not need to pre-register for the program. Click below for group registration.